PORTSMOUTH — After four years of softball and basketball at Portsmouth High School, Peighton Williams wasn’t ready to leave town. Williams made it official on Wednesday evening, signing a letter of intent to play college softball at Shawnee State. “I want to say thank you to my parents for pushing me when I was little, to the teachers and coaches at Portsmouth High School that have taught me to be the athlete that I am — especially Kristen (Bradshaw, Portsmouth basketball and softball coach),” she said. Few have made an impact on a program the way Williams did with the Lady Trojans. On the diamond, she was named first team All-District three times during her four-year career, and was named honorable mention All-State once. This season, she batted .532 and helped the Trojans turn a lost season into a success. Portsmouth won 10 of its last 19 games, including a first-round playoff matchup with Fairland. On the basketball court, Williams scored over 1,600 points with the Trojans, earning an All-Ohio honorable mention three times. She graduates holding school records for points in a game (41), points in a season and rebounds in a season. When it came time to pick a college, Williams had her choice in schools. Rio Grande offered a basketball scholarship, and Marietta College offered a dual scholarship for basketball and softball. Williams even heard from schools as far away as New York’s St. Francis College. But Portsmouth is in Williams’ blood. Once she decided that she wanted to focus on softball, the decision was an easy one. “Everyone wants to work hard to go different places, but I believe that you can still work hard and represent where you came from,” she said. Williams will be joined at Shawnee State by some of her best friends, who also happen to be area softball standouts. Abby Sparks and Taylor Dempsey of Wheelersburg, and McKenzie Whittaker and Megan Shupert of West all played with Williams during travel ball growing up. “I think it would be awesome to continue to play with them. It’s such a great group of girls,” Williams said. 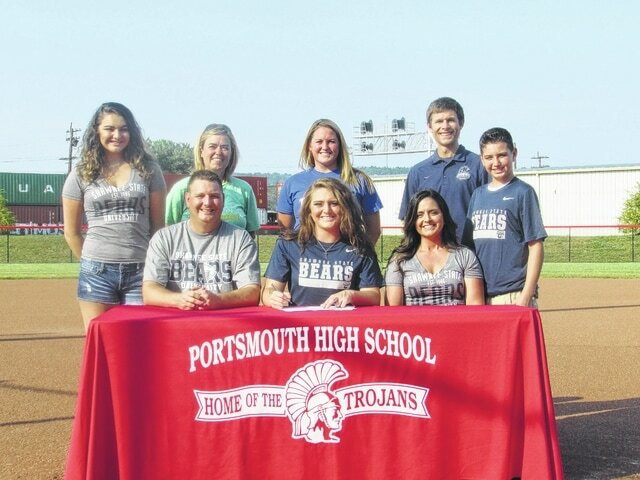 In her two years as the Portsmouth girls basketball coach and her one year as the softball coach, Bradshaw has seen Williams take her game to the next level. Williams also hopes that her hard work has left an impact on her Trojan teammates.